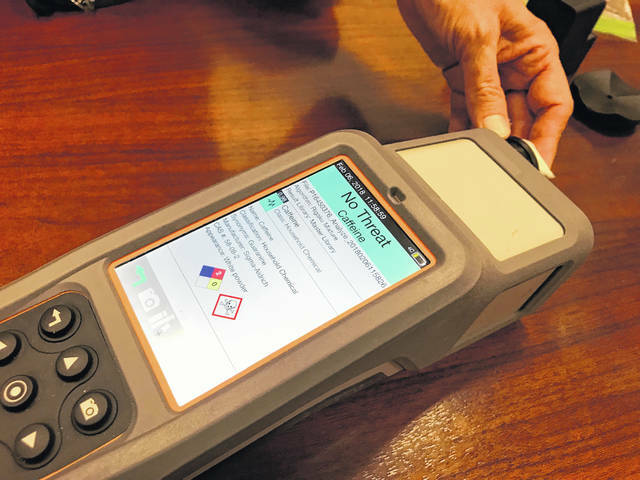 Pictured is a fentanyl detection device which Sen. Sherrod Brown, D-Ohio, and Sen. Rob Portman, R-Ohio, hope to provide for Ohio law enforcement officers to detect opioids, such as fentanyl in the field. The Congressmen plan to introduce the bipartisan bill called the POWER Act to provide the equipment through a grant from the justice department. WASHINGTON, D.C. — U.S. Senator Sherrod Brown announced Wednesday afternoon plans to introduce a bill aimed to help protect Ohio law enforcement officers from accidental opioid overdoes by providing them new portable, high-tech, drug screening devices for in the field. During the news conference call, held Wednesday, April 25, Sen. Sherrod Brown, D-Ohio, said he and Sen. Rob Portman, R-Ohio, plan to introduce the bipartisan bill called the POWER Act. The bill will provide equipment through a grant from the justice department. The devices will help Ohio officers and first responders using the same screening equipment that Customs and Border Protection agents use to detect deadly opioids, such as fentanyl, which is about 50 times more potent than heroin. President Trump signed the Brown’s INTERDICT Act for Customs and Border Protection into law earlier this year. Opioid abuse in Ohio is a serious crisis with thousands waiting for treatment, Brown said. Ohio loses 11 people everyday to the opioid epidemic, Brown said. The accidental overdose of an East Liverpool police officer demonstrated the danger for first responders in the field, Brown noted. Davis said the devices will be more accurate than their current chemical reaction method for identifying unknown substances in the field. “It is no wonder that law enforcement has strongly endorsed this bill that is being presented by Sen. Brown and Sen. Portman. All of us have seen the destruction that these dangerous narcotics have created in our communities and every tool that we can make available to enhance safety for our first responders in fighting this epidemic should be made available,” said Davis. Brown said he is uncertain of how much money the grant program will need to get started. He estimated it would start with about $20 million. Additional funds will be added based on need. He also was uncertain of the cost for an individual machine. Davis said although each department will determine how many devices will be needed, every officer would likely not need carry to a device with them. He said it could be a similar situation to when the need arises and an officer makes a request for a K-9 to be brought to the scene, but in this case, likely a supervisor would respond to the scene with a device.